The origins of Emilio Lustau S.A. date back to 1896, when Mr. José Ruiz-Berdejo, a secretary to the Court of Justice, started cultivating the vines of the family’s state, named Nuestra Señora de la Esperanza, in his spare time. In these humble beginnings he made wines which were then sold on to larger Sherry producers. This activity was known as being an almacenista or stockeeper. In 1931, his daughter, María Ruiz-Berdejo Alberti, acquired a small winery closer to the centre of Jerez de la Frontera and moved there all the preexisting soleras, gaining notoriety and visibility. In the 40’s, Maria’s husband, Emilio Lustau Ortega moved the winery to the old Santiago district, in the historic quarter of Jerez de la Frontera. There, in buildings that were part of the historic Moorish walls of the city, he slowly began to expand the business, still as an almacenista. In 1945 Emilio Lustau stopped being almacenista and began to commercialize its own brands: Papirusa, Jarana, Escuadrilla, Emperatriz Eugenia and Cinta de Oro were some of them. In 1950, the company began exporting its own sherry wines. Under the direction of Mr. Rafael Balao, Lustau became one of the most innovative companies in Jerez. The 80’s were an amazingly prosperous decade where the collection of Lustau wines developed greatly: the Solera Familiar range took shape, the first Almacenista bottlings and concept emerged (1981) and Lustau started to age the Vintage Series (1989). In 1990 Lustau’s destiny changed when it merged with a Spanish family owned company prominent within the wine and spirits business: Luis Caballero. This was a milestone in Lustau’s history and meant important financial support and the possibility of further expansion and development. In the year 2000, Lustau acquired six 19th century bodega buildings in the centre of Jerez. These picturesque buildings were restored to their original glory and today house the principal ageing bodegas of Lustau, which heads the Luis Caballero Group’s Sherry Division. Bodegas Lustau is considered a world-class benchmark for top-quality wines. 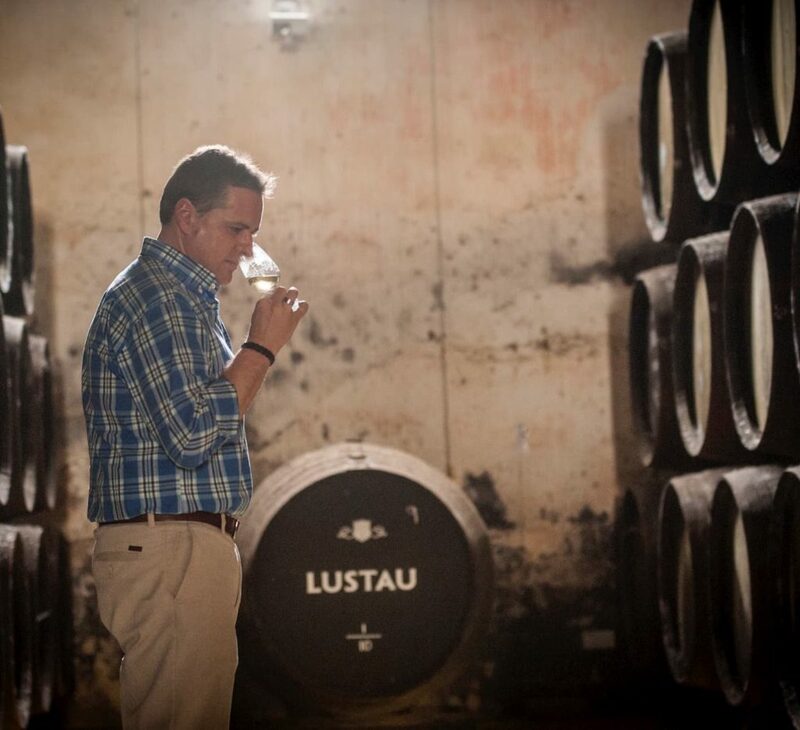 Lustau has recently been awarded with multiple medals and trophies, being the most important Best Spanish Winery in 2011 and Best Sherry Producer in 2014 and 2016 awarded by the International Wine & Spirit Competition. Lustau has also been awarded two consecutive times (first winery in history) the Len Evans Trophy to consistency in 2011 y 2016 by the International Wine Challenge. The House of Lustau is a sanctuary of peace. A majestic, silent space where time stands still and creates a unique atmosphere. These are cathedral-like buildings with very high ceilings and immaculate albero sand floors, which help to keep the temperature and humidity stable. In the dim light which penetrates the windows, the buildings take on the appearance of temples, and drinking a glass of Sherry within their walls becomes a mystic experience. Lustau is the only winery that produces wines in each of the three cities in the Sherry triangle: Jerez de la Frontera, El Puerto de Santa María and Sanlúcar de Barrameda. Located in a privileged and unique area. Vineyards and wineries have filled the countryside and shaped the cities of the Sherry region since its inception. White limestone hills, known as albariza and wineries with vaulted, cathedral-like ceilings; have filled every corner in this geographic triangle with incomparable colours, aromas and sensations. The cryptic language of the Cellar Masters. These symbols, drawn in chalk on the head of the wooden casks, tell us the story of Sherry wines from the very beginning and their evolution through their ageing process. The biological ageing, in which the wines age under a veil of yeasts known as flor; is a completely natural phenomenon. These yeasts prevent the wine from being in contact with the air and transform its flavors and organoleptic profile. This miracle originates in the white albariza soils that dominate the vineyards in Jerez and develops successfully thanks to the special conditions of temperature and humidity inside the wineries. Each year, our vineyards receive roughly 3,000 hours of sunshine, accompanied by relatively heavy rainfalls of about 600 l/ m². The landscape of the area consists primarily of white limestone hills, known as albariza. Its singularity is due to the fact that long ago this region was under the ocean for millennia. Located in Pago Montegil. The vines are planted in albariza white limestones soils, with moderate slopes. Near to the coast, in Pago Abulagar. Sands, clays and albariza soils are combined in this vineyard. It’s the only vineyard of the Sherry region where the three allowed grape varieties (Palomino, Moscatel and Pedro Ximénez) are planted. Palomino is the most traditional and versatile of all the allowed varieties and has been used here for centuries. Nowadays it is the unquestioned leader within the Sherry region. Its greater sugar content and higher levels of acidity produce sweet wines of great quality. A very aromatic variety used in the Jerez Region for the production of floral and fragrant sweet wines with the same name. More than 120 years of history and expertise combined with our team’s passion and dedication shape the character and personality of our wines. Sergio Martínez is responsible for all Lustau wines. After more than 14 years in the House, Sergio leads the winery’s oenological team since 2016. Like his predecessors in this position, Sergio has been recognized as the Best Fortiﬁed Winemaker and Best Winemaker of Spain by the International Wine Challenge in 2017 and 2018. In 1990, Fernando joined The House of Lustau as Master Blender and Quality Control Director, responsible for overseeing the production process of Lustau vermouths and brandies, from the distillate to the final product. The vast experience Fernando has accumulated during a lifetime of dedication to spirits, liquors and fortified wines was reflected in his appointment in 2013 as a member of the Sherry Regulatory Board tasting panel. The day-to-day work and the wisdom transmitted from generation to generation of craftsmen, come together in the care of our casks. The master coopers work hard every day to maintain our wooden century-old wooden legacy.